Perfect for heating medium sized areas, boasting coverage of up to 250 square meters. It is one of the cleanest burning heaters on the market, with low emissions of 0.5g/kg, burning 3 times cleaner than the national standard for emissions of 1.5g/kg, making the geo Geo one of the most environmentally friendly wood heaters available. One of the standout features is the glass landscape door, designed to highlight the roaring fire. Designed to complement modern décor, the Geo comes with a leg base and a removable handle. 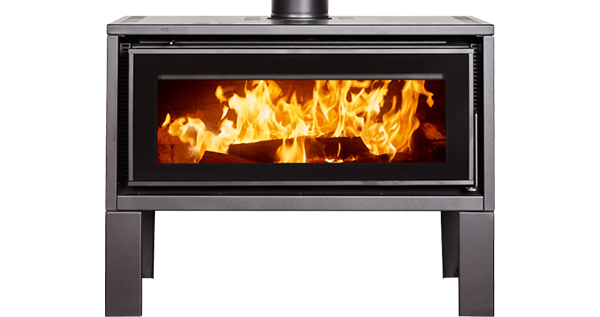 Backed with a 10 year firebox warranty, the Kent Geo will keep your family warm for many winters to come. leg base and removable handle. Sleek and sophisticated, features clean and simple lines for the ultimate modern home. This Wood Heater combines technology with modern design.